Flat Endless Slings – FERRETERRO INDIA PVT. LTD. Endless Flat Slings are the most versatile of the entire web sling configuration. Endless Web slings can be used in all 3 types of hitches and perfectly suited for use with traverses in lifting or choking use. The wear points can be adjusted around the circumference of the sling to increase sling life. Compared to eye to eye slings, endless web slings are much simpler to sew and thus are highly economical lifting devices. Made of Double thickness of Webbing. Flat & Wide Load Bearing surface. Easy handling in choking use. Loads are always carried by two strands. Higher load capacity compare to web slings of equal width. Available in simplex or duplex configuration. 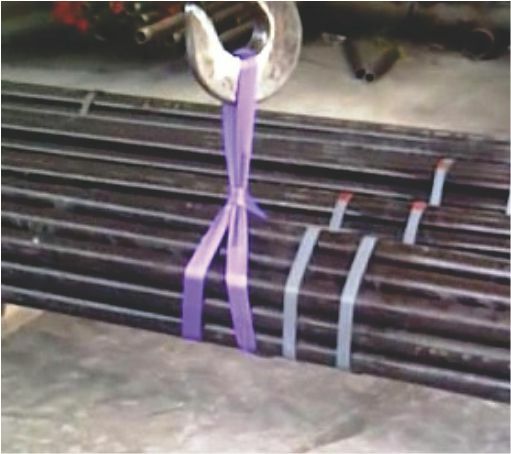 Best uses in lifting pipe bundles and in exports .